Yes, he was 94. Still, I am sad about the passing of President George H.W. Bush. What a great and honorable life he lived. And what a smile — in success and failure, despite the death of a child, and living an increasingly public life even after his presidency — this mostly because of two other children in politics. I was honored to have spent a bit of time with this president. 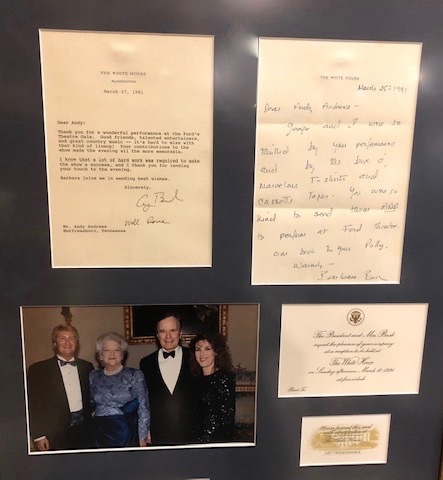 Not that anyone has asked, but my memories of President Bush include eating the “souse” (look it up) he had ordered to be served in The Blue room of The White House. I swear I can still taste it! I remember once leaving a backstage area with my wife, Polly. We’d been at The White House that afternoon and the president was in as happy a state of mind as, I suppose, anyone ever gets. The (first) Gulf War had been ended in 100 days—a stunning victory for our country with an unprecedented low number of American casualties. That evening after speaking, Polly and I waved to a crowd of happy people as we got into a limo for the short ride back to the hotel. The crowd had been effusive with all eyes on the president and standing ovations for his every word or move. That day, it had been announced that President Bush had an 89 percent approval rating. It was the highest any president had ever scored (FDR had come closest with an 83 percent in 1938). Polly and I both remember well the words I spoke in that moment. 19 months later, the president lost badly to a previously unknown governor from Arkansas. And I’ve never since had faith in a public opinion poll. Every year, whoever the president might be, there is an event called The President’s Charity held at Ford’s Theater for the preservation of that historic landmark. Traditionally, the president personally chooses the speaker, artist, entertainer — or all three — for the evening’s celebration. One particular year, I was the only “spoken word artist” the president had chosen. The line-up included The Oak Ridge Boys, Randy Travis, Alan Jackson, Alabama, Garth Brooks…and me. My seven minutes was situated somewhere in the middle. Honestly, I don’t remember who performed before me or after. I don’t even remember much of what I did that evening. I do, however, remember what happened as I began my remarks. Actor John Ritter was the emcee for the event. I waited in the wings, listening as he introduced me. When the polite applause began, I walked on to the stage and realized that it was the first time I had even been in the theater. I saw immediately that there were two balconies. Glancing up and to the left, I spotted the draped box of eight seats where President Abraham Lincoln had been assassinated. Moving to the center of the stage, I looked down and into the audience. One couldn’t help but notice the President of the United States in the very middle of the front row. He and Barbara were holding hands. To their left sat the Vice-President, Dan Quayle and his wife, Marilyn. To the president’s right, Morgan Freeman was seated. The applause died away and for a moment, I said nothing. With eyes widened, I simply stared into that area of focus, front row, center seats. “I just have to say that I am really nervous with you here,” I said. No one moved. There was a frozen smile on the president’s face, but a tiny bit of uncertainty began to show. I wiped my palms on the trouser legs of my tuxedo and took a tentative step forward, continuing to peer into the middle of the first row. The audience was eerily still now, everyone focused on what appeared to be happening, certain they were witnessing a disaster and hoping that for God’s sake, someone would come rescue this terrified young man. I just stood there, smiling and watching. It might have been the longest laugh I ever got from an audience in my entire career. However, I knew then and still know today, that while the “joke” might have been credited to me, “the moment” was enabled by the president of the United States, his First Lady, the incredible connection they had as a couple, and their sense of humor. Andy Andrews new weekly podcast, “The Professional Noticer” is being broadcast from Orange Beach, Alabama, and already has listeners in 63 countries. Subscribe for free on your favorite media platform or at AndyAndrews.com/Podcast.